This is the twenty-sixth post in the Around the World Birthday Extravaganza Series. Please scroll to the bottom to see all the other posts in this series. 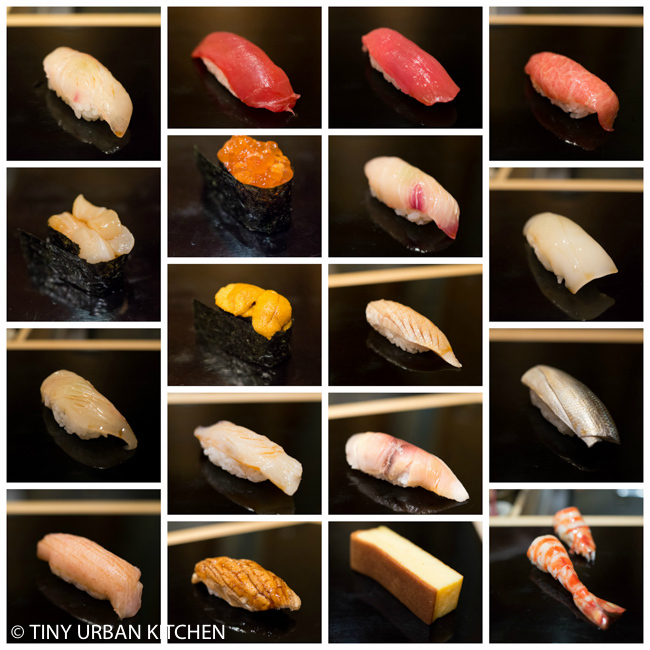 Sushi Harutaka consistently ranks as one of the best sushi restaurants in Tokyo, at least among voters of the Japanese online community food site Tabelog. Chef Harutaka Takahashi spent 13 years working for the world famous Jiro Ono before opening up his own place. Diners love Sushi Harutaka because you get the quality and style of the sushi at Sukiyabashi Jiro, but at a much more relaxed and friendly environment. For example, meals at Sukiyabashi Jiro typically take 30-40 minutes, and everyone sits in serious silence. The environment at Sushi Harutaka is much more relaxed, and you can take time with your meal! It’s also known as the place where Tokyo’s top chefs like to eat. Regulars include Yamamoto-san from Ryugin, Saotome-san from Mikawa Zezankyo, and Yoshitake-san from Sushi Yoshitake. We finally had a chance to visit Sushi Harutaka for dinner in November of 2015 after an active day hiking at Mount Takao. Chef Harutaka Takahashi was one of Jiro Ono’s best students, and his style of sushi is very similar to Jiro’s style. The rice is very al dente and the vinegar is strong. I personally found it to be just a tad too strong for my taste, but Bryan thought it was good. It’s no surprise, since Bryan particularly enjoyed Sukiyabashi Jiro as well, precisely because of the aggressively flavored rice and fish. Sushi Harutaka had two Michelin stars in 2011 and 2012, lost them in 2013, and regained them in 2015. Sadly, it most recently lost its two stars again in 2016. We ordered the sushi-only omakase, and here is a look at our meal! Freshly made wasabi ground from the stem. Hirame (flounder) and ika (squid). Three types of tuna: maguro (red tuna), chutoro (medium fatty tuna), and otoro (fatty tuna). Kohada (gizzard shad), kobashira (surf clam), shima aji (horse mackeral), and ikura (salmon roe). Mirugai (geoduck), saba (mackerel), anago (saltwater eel), and one of my favorites alwas, tamago (egg). My strongest impressions upon leaving the restaurant was that the rice was very al dente and there was a strong use of vinegar. I personally found the flavors to be too strong, but Bryan enjoyed the meal. I remember thinking that there were other sushi places that I enjoyed much more on this trip. Our overall meal cost just shy of $400 for the two of us, including a few beers and sake. If you want to try Jiro Ono’s style from one of his best students, this is a popular option if you can’t get into Jiro. You’ll get that same al dente rice and heavily vinegared rice, in true, traditional Edomae style. If you don’t like strong, heavily-vinegar flavors, you may want to consider other sushi restaurants (there are many excellent ones!). Mizutani is another famous Jiro-alum who uses less vinegar but also has a slightly less al dente rice texture (though it’s still very good!). I’m not sure why the restaurant lost two Michelin stars in 2016. I wonder if the sushi I was tasting in November of 2015 was closer to the version that had lost the stars. At the time, I thought I was eating at a 2-Michelin starred restaurant. However, I distinctly remember being disappointed with the food, considering its super high rating and its price. I chalked it to my aversion of salty food, but perhaps there’s something to be said about the quality at that time. I know Harutaka has regained his stars after losing them before, so I do hope he will quickly regain them. I’m guessing the local Japanese people don’t care and still love his restaurant (and probably don’t fully trust the Michelin guide when it comes to Japanese food). And I bet those regulars (hello top sushi chefs in Tokyo!) are still coming. Thanks for the report and nice photos! Rumor has it that Harutaka didn’t want the stars, and made sure to serve sub-standard food to the inspectors deliberately. No idea if this is true or not but it’s what I heard. Also, not to be pedantic, but the part of wasabi that is grated and used in sushi preparation is the stem, not the root. The sushi you labelled Tai … looks very much like Ika (squid) to me. Mizutani last service ever will be Oct 29, 2016 … he is retiring. You’re right! Can’t believe I missed that. Thank you – the post has been corrected. I’ve heard about Sushi Sho not wanting any stars, but didn’t know specifically of others.